This decision was made by Janrain, and Stack Exchange did not have any part in it. You can still use myOpenID to log in to Stack Exchange, but be aware that any outages in the myOpenID service will mean that you are unable to log in to Stack Exchange until Janrain fixes it – which may take several days, or weeks, or never. After February 1, you will no longer be able to use myOpenID to log in to Stack Exchange. Stack Exchange will not be able to answer any questions about why myOpenID is down or when it will be working again. If you do not have any other login credentials on your account by February 1, you will be locked out, and Stack Exchange will be unlikely to help you recover your account. To avoid getting locked out of your Stack Exchange account, we strongly suggest that anyone using myOpenID as their primary (or even backup) login add a new login method to their Stack Exchange account. We're also going to remove the "myOpenID" button from the sign-up/login page soon, in order to discourage new users from signing up using myOpenID. Open up your user profile page (by clicking on your login name at the top of the screen) and click the "my logins" link above the bio box on the right hand side. You should see a list of all of your logins. To add a new login, click "add more logins..." at the bottom of the box. Choose the new login from the list and follow the steps to confirm. If you choose, you can remove your myOpenID login by clicking the same "my logins" link, then clicking "remove" next to myOpenID. If you are adding a Stack Exchange OpenID, you will receive a confirmation email. You must click the link in the email to confirm your email address before the Stack Exchange OpenID will show up under "my logins". Please make sure that you are already logged into your account when you click the confirmation link; otherwise, you will create a new account that needs to be merged with your old one. If you encounter any trouble adding logins, or accidentally create a separate account that you would like merged, please fill out our contact form. So, what happens for those of us who may forget to add another authentication method, when/if the service dies? Perhaps an idea to e-mail this notification to users also, and/or (when the stuff hits the fan) include a get-of-jail-free way of accessing ones account in it. As an aside: Is there any similar services that Stack Exchange could switch to. 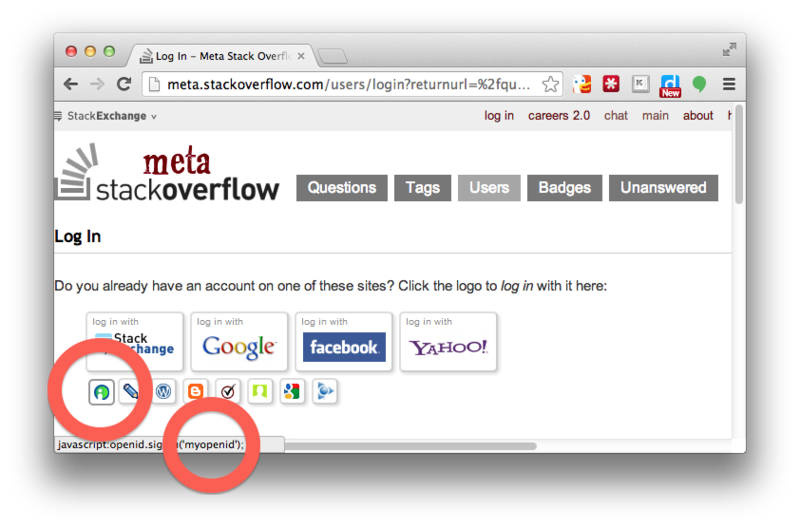 Personally, I really liked the two-factor authentication to guard all my Stack Exchange secrets! I wanted to reach out personally to let you know that we have made the decision to end of life the myOpenID service. myOpenID will be turned off on February 1, 2014. In 2006 Janrain created myOpenID to fulfill our vision to make registration and login easier on the web for people. Since that time, social networks and email providers such as Facebook, Google, Twitter, LinkedIn and Yahoo! have embraced open identity standards. And now, billions of people who have created accounts with these services can use their identities to easily register and login to sites across the web in the way myOpenID was intended. By 2009 it had become obvious that the vast majority of consumers would prefer to utilize an existing identity from a recognized provider rather than create their own myOpenID account. As a result, our business focus changed to address this desire, and we introduced social login technology. While the technology is slightly different from where we were in 2006, I’m confident that we are still delivering on our initial promise – that people should take control of their online identity and are empowered to carry those identities with them as they navigate the web. For those of you who still actively use myOpenID, I can understand your disappointment to hear this news and apologize if this causes you any inconvenience. To reduce this inconvenience, we are delaying the end of life of the service until February 1, 2014 to give you time to begin using other identities on those sites where you use myOpenID today. Speaking on behalf of Janrain, I truly appreciate your past support of myOpenID. If you get locked out of your Stack Exchange account, and you remember which e-mail address you had given your OpenID provider, you can get back in to Stack Exchange by doing a password reset on that e-mail address. Just go to the login link at the top of this page, and then follow the link that says click here to recover your account. If you enter the right e-mail address, you'll receive a link that will let you set a password for your Stack Exchange account and get back in. This adds a Stack Exchange OpenID login to your account (which exists alongside the now defunct myOpenID login) so you can select log in with Stack Exchange each time you need to log in from this point on to get in to your account. I just used this method to get back in to StackExchange as myOpenID has been down for almost a day now. TIP: Try procedure from one of stackexchange sites (like stackoverflow.com), not your general networkprofile. Explanation: Procedure turned out to be buggy for me when I tried to add new OpenID from stackexchange network profile. Once I went to one of stackexchenge sites (like https://cstheory.stackexchange.com/ ) things seemed to worked finally. Bug: SE team might like to test/fix procedure from SE site. A better solution would be to leave the myOpenID button in place and present an interstitial warning when someone uses it. That would stop anyone from starting attaching a new myOpenID account. It would notify users relying on myOpenID of the problem. It would give users an opportunity to go add another login method to their account if their only current option is myOpenID. Simply removing the myOpenID button is going to leave people in the dark and unable to correct the problem themselves. Not the answer you're looking for? Browse other questions tagged support login user-accounts myopenid . Missed the MyOpenID demise; account lost forever? Do Login Alternatives to OpenID Create A New Account? My OpenID provider is shutting down; how do I change my Stack Exchange login? MyOpenID is no longer supported - alternatives most likely to be immune to this type of change? “Add logins…” option doesn't behave as I'd expect it to?